He always dreamed he'd be coaching in Mission, but the team he ended up leading isn't something he could have ever seen coming. David Gilpin was a young, passionate and energetic assistant coach at Mission High School in 2002 with 12 years of experience under his belt when the town’s newest school – Mission Veterans Memorial – first opened and was looking to fill out its staff. Gilpin, who graduated from Mission High in 1984 and played for the Eagles, had no intentions of leaving his alma mater. But with two other young Mission graduates – Tommy Lee and Lupe Rodriguez – on the same coaching staff, Gilpin decided he may find a faster track to a head coaching job at Mission Vets. He applied for the head job knowing he may not be ready but then made the move over as an assistant under Bucky Rodriguez. When Bucky Rodriguez left two years later after posting a 2-17 record, Gilpin thought he was in a good spot to take over the program and transition into his first head coaching job. The principal at the time went as far as telling Gilpin the job was his – but when the school board met, the administration made the decision to open the job up to outside applicants, eventually resulting in the hiring of Carlos Longoria. Sticking around proved to be the right decision for Gilpin, who emerged as the unquestioned front-runner for the job when Longoria left before the start of the 2009 season. His interview went well and Gilpin, who was in his 18th year of coaching, finally had a chance to build his own program. Gilpin’s journey into the coaching world – and rise up its ranks – is a story he uses to inspire his players to this day. After graduating from Mission, Gilpin attended the University of North Texas before returning to his hometown as a coach right out of college. He started at the 7th grade ‘B’ team level before working his way up to the varsity staff coaching defensive line under Sonny Detmer in 1993. Gilpin worked for three different head coaches at Mission and two head coaches at Mission Vets before taking over the Patriots’ program. 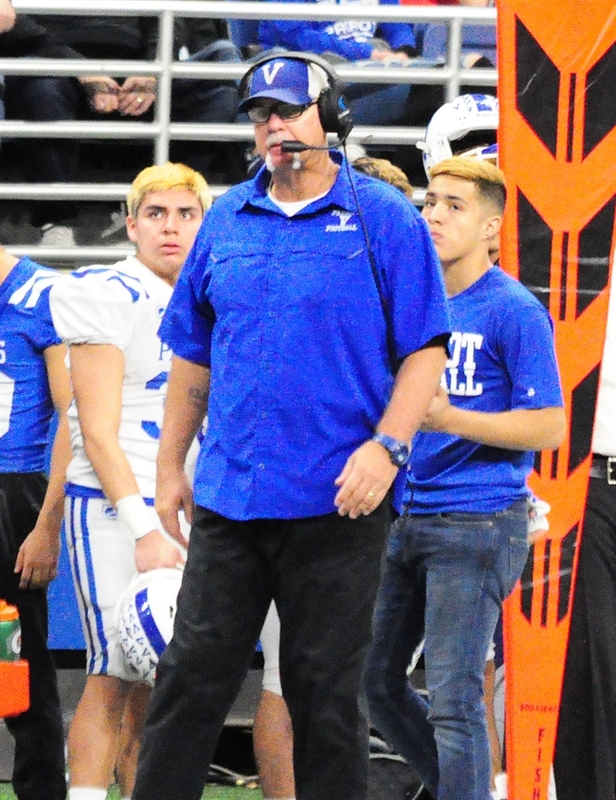 Detmer, the patriarch of one of the most well-known families in Texas high school football, didn’t just give Gilpin his start in the coaching world – he also gave him a subtle wakeup call that sparked his dedication to success in the profession. Gilpin was preparing for his first year as the defensive line coach under Detmer and was in charge of encouraging his position players to be as active as possible in the summer strength and conditioning program as the team got ready for the start of the season. The coaches sat down in their first meeting of the year, and it didn’t take long for Gilpin to be called out. Detmer didn’t recall the incident, but agreed the young coach was a fast learner who was eager to soak up the vast knowledge present on the staff at Mission High. Gilpin, who now spends more time coaching the offense at Mission Veterans Memorial, was a fixture on the defensive side of the ball early in his career. Gilpin’s hard work and the lesson Detmer inadvertently taught him set him on a path to eventually become the head coach at Mission Vets. The success came immediately as he led the program to its first winning season in 2009 and its first playoff win in 2010, when the Patriots defeated Flour Bluff 30-24 before finishing 10-2 with a loss to Victoria East in the second round. But after the early success, Gilpin said the 2011 season was an important step for him as a head coach and for the Mission Vets program as a whole. The Patriots entered the season looking to recover from losing a handful of talented seniors but had enough talent back that they still expected a big year. When their all-state starting quarterback went down with a torn ACL just two games into the season, Gilpin was left scrambling. Mission Vets ended up converting a middle linebacker to quarterback and the Patriots went 2-8 while averaging just 14 points per game on the season. “To go from 10-2 to 2-8 was certainly an eye opener,” Gilpin said. “But it made me a better coach. I’m a very energetic and passionate guy, so to have to streamline everything and keep the team together and my emotions in check – there’s not a doubt in my mind it made me a better coach to go through that adversity. Gilpin ensured it wasn’t an experience he had to go through again as the Patriots bounced back to win six games and return to the playoffs in 2012. Mission Vets has built on that mark every season since, going 7-4 in 2013, 8-4 in 2014, 8-4 in 2015, 8-5 in 2016, 10-2 in 2017 and 12-2 in 2018. The Patriots have significantly raised the bar for the program, having won at least one playoff game in five straight seasons while advancing to the regional finals in 2018, becoming just the third Rio Grande Valley team to accomplish the feat since 1990. “When I first got hired when the school opened, I was at a tradition rich school at Mission High,” Gilpin said. “We were the brand new school, the new kids on the block and most people in town resented us because they’re Mission High families. You still fight that now – it allows me to keep a chip on my shoulder and talk about fighting for respect. Gilpin’s commitment to the Mission Vets program has a lot to do with his family’s ties to the area, and a lot of the program’s success over the last few years is thanks to the play of his youngest son, Landry Gilpin, who started at quarterback for the Patriots as a senior. Landry first took the field as a freshman quarterback in 2015 after entering the season as the third-string quarterback and was an instant star. He took it to new heights when he was named the Mr. Texas Football award winner for 2018. Landry rushed for 895 yards and 11 touchdowns while throwing for 1,589 yards and 11 touchdowns that first year, essentially saving the Patriots’ season after star QB Diego Hernandez went down with an injury the same week the team’s backup transferred out of the district. His first start came six games into the season in a 34-3 win over Roma. After starting the game at receiver, Landry stepped in for Hernandez and threw for 110 yards and two touchdowns and rushed for 150 yards and a score on just eight carries. Landry said he has a special relationship with his father and opts to ride to school with his dad an hour and a half early each morning just to spend that extra time with him each day. “I know it means a lot to him and it means a lot to me to be able to spend those early hours in the morning with him,” Landry Gilpin said. “I have my own car and I could use that, but I’d rather wake up a bit earlier if it means I can have that time to talk to him in the morning. That type of family-first mindset is a big reason why David Gilpin says he’ll never leave Mission Veterans Memorial until he “retires, is fired or dies on the field.” In addition to his wife Jo Ann and youngest son Landry, Gilpin’s three older children – Shania, Thalia and Jonathan – all live in the area, as do his parents Ed and Patricia. David Gilpin credits his dad, who spent 30-plus years as a Baptist preacher in Mission, and his mom, who was an educator for 30-plus years in the Mission school district, for instilling in him a commitment to the job at hand. “I have to believe that upbringing and stability had some impact on me,” Gilpin said. “In our business, it’s rare. I don’t want to leave. I will finish my career here, whether I retire, whether I get fired, or whether I die on the field. And who would want change after the season the Patriots just put together? “I’m hoping we leave some kind of legacy by the time we’re done here,” David Gilpin said. “It’s a pretty cool thing to have been on the field for every single game our school has played. I think we’ve built the program to where it’s a year in, year out threat. But I’m not stupid enough to say it’s all about football, because it’s not. It’s about molding young men, and we’ve done a good job of that. But I’m also not stupid enough to say that’s all that matters, and we don’t care if we’re 0-10, because we do care. “We’re trying to do both here – have a winning program and build men of character. We’ve done both of those things.